A Halloween billboard in West Hollywood has been commandeered by pro-Donald Trump street artist Sabo. 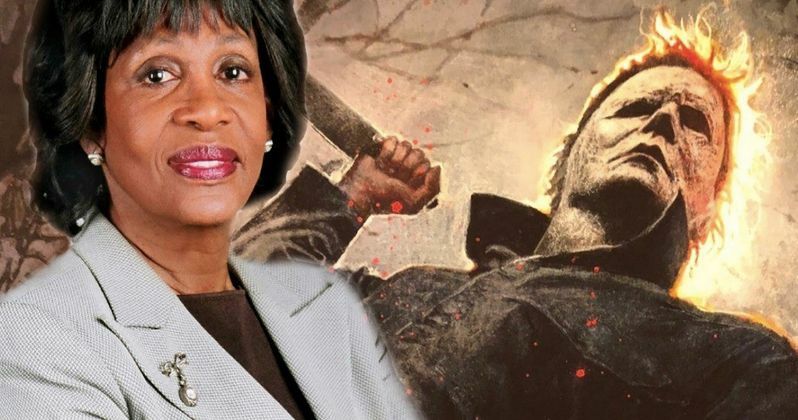 The conservative artist climbed up to the billboard and pasted a massive picture of Maxine Waters' face over Michael Myers. The advertisement now looks like Congresswoman Waters is stabbing a victim with the hashtag "uncivil" on one side and "democrats," on the other. While Sabo didn't pick the most flattering picture of Waters, the billboard looks like he spent some time to get the dimensions to match up with The Shape's face. With the midterm elections only a few weeks away, Democrats and Republicans have been going after each other through the press, TV ads, internet ads, and everything in between. Targeting the Halloween billboard is pretty smart since it's the biggest movie of the weekend and it's also in a prime location. When asked why he specifically targeted Maxine Waters in his latest piece of work, Sabo stated that it was over the fact that the congresswoman had told a crowd in June to "make things uncomfortable for President Donald Trump and his Cabinet members." Waters' remarks were seen as controversial by both political parties at the time. Maxine Waters told an enthusiastic crowd in Los Angeles to resist Donald Trump and the GOP. Trump and Waters have been trading jabs in public for the last several months, with the President of the United States claiming that Waters is a "low I.Q. person." Waters shot back calling Trump a "liar and a conman." The congresswoman has yet to speak out about the Halloween billboard. She had this to say to the crowd in Los Angeles back in June. "If you see anybody from that Cabinet in a restaurant, in a department store, at a gasoline station, you get out and you create a crowd. You push back on them and you tell them they're not welcome anymore, anywhere." Since Maxine Waters made her statement, some of Donald Trump's cabinet members have had a pretty hard time going out in public. Even Fox News personality Tucker Carlson says that he can't go out to restaurants anymore without someone yelling profanities at him. Additionally, Texas Senator Ted Cruz, White House press secretary Sarah Huckabee Sanders, presidential senior adviser Stephen Miller, and Homeland Security Secretary Kirstjen Nielsen have had some pretty intense outings that have been spoiled by protesters from the Left. The Halloween billboard in West Hollywood is just the latest piece of protest art from Sabo. The pro-Donald Trump artist gained fame back in 2014 when he targeted Democratic politician and then-candidate for governor of Texas Wendy Davis, who is strongly pro-life. Sabo made posters, mostly with Barbie dolls with Davis' face pasted on them with plastic babies in the bellies of the dolls. Since then, Sabo has taken on a number of different politicians and causes. He recently also took aim at Sacha Baron Cohen's Who is America series as well. The Hollywood Reporter was the first to break this news.